News has seemed pretty gloomy for our fellow primates. A recent report found that over half of the world’s primates are nearing extinction. Impacted by deforestation, illegal trafficking, and hunting for the bushmeat and pet trades, primate species are quickly disappearing. 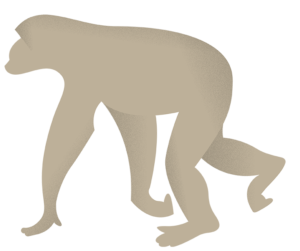 While primates are our closest relatives, they can also be keystone species. This means that ecosystems could drastically change if the primates disappear. But here’s the good news…there are conservation efforts all over that are saving our primate cousins! Countries are taking action to help save their native primates, through government intervention and support from organizations on the ground. China set aside natural preserves for snub-nosed monkeys and other biodiversity. Malaysia and Indonesia are promoting sustainable palm oil production to prevent further primate habitat loss. Many non-governmental organizations (NGOs) are educating people across the globe about these magnificent animals in hopes that they will be inspired to protect them. Let’s celebrate how hard work and persistence have been successful for primate conservation and maybe each of us can come up with one thing we can do to help. After all, as Dr. Jane often reminds us, every individual can make a difference. One of the greatest primate conservation stories is that of the golden lion tamarin. Back in 1991, only 200 golden lion tamarins were found in the Atlantic coastal forests of Brazil. They were listed as “critically endangered” and there was little hope for their survival. That’s when a few caring individuals decided to step in. The Golden Lion Tamarin Conservation Program was born and spearheaded largely by the Smithsonian’s National Zoo and Conservation Biology Institute.The program began breeding the tamarins in zoos and reintroduces them into safe forest areas. They also capture and relocate wild tamarins from threatened areas to safer ones. Conservation efforts not only focused directly on the animals, but also on the people that share their environment. Brazil established the Reserva Biologica de Poço das Antas, in addition to other protected areas, where locals can see and learn about the wildlife. 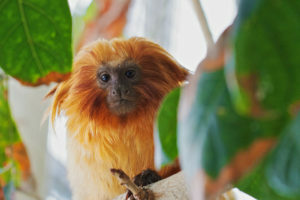 The people of Brazil also created the Golden Lion Tamarin Association to coordinate conservation and provide educational materials in the tamarins native area. There are now are approximately 3,000 golden lion tamarins in the forests of Brazil. Nearly one third of this population is related to monkeys that were raised in human care. In April of 2001, the Golden Lion Conservation Program celebrated their 1,000th birth – a benchmark worth celebrating since saving this species is not an easy task. Organizations and individuals worked tirelessly to monitor progress while partnering with local community members to protect the species sustainability. Today, the golden lion tamarin is listed as “endangered,” which is one step up from their previous status. The golden lion tamarin became a national symbol and was selected, through public vote, by Brazil’s Central Bank to appear on their new 20 Reais note. Virunga National Park lies in the Democratic Republic of the Congo (DRC) and is home to the critically endangered mountain gorilla. In 1981, there were only 254 mountain gorillas left on the planet, with most living in Virunga and the neighboring Bwindi Impenetrable National Park. Tourism is a booming industry at Virunga, which can economically help local communities as well as provide financial support for gorilla conservation. Since many tourists visit specifically to witness wild gorillas, conservationists decided to take more direct action to ensure the survival of this great ape. Virunga now provides direct veterinary treatment to some gorilla troops, while others do not receive human care and are left completely wild. There are also rangers that protect the gorillas and Virunga’s borders. The combined efforts of receiving veterinary care and poaching protection played a large role in the success of conserving this species. Today, there are about 880 mountain gorillas living in Virunga and Bwindi. Still, the mountain gorillas are at risk. The DRC has a long history of civil unrest and protection of natural areas is increasingly difficult. 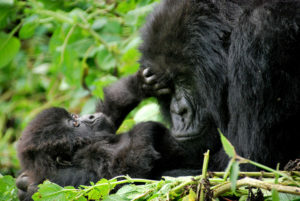 The Netflix movie Virunga, released in 2014, illustrates these struggles and explores the controversy surrounding an oil company’s interest in the park. After Netflix aired the documentary, the oil company interested in Virunga halted its oil exploration there. This was largely due to efforts from NGO’s, such as World Wildlife Fund (WWF), and was likely fueled by public resistance to drilling in the park. The release of this movie was a great conservation outreach effort. Before the film, many people had never heard of Virunga, much less the gorilla’s dire situation and the conflict over their protected habitat. Since primate species live all across the world, utilizing media to spread awareness and promote conservation has huge potential for saving these creatures. Virunga isn’t the only example of this and we hope it won’t be the last. Be Positive, Spread Hope, Take Action. “It’s not a pretty picture, but there are always reasons for hope,” says Dr. Jane. Share movies, pictures, and fun facts to spread the word and tell your friends about these magnificent creatures. You never know, maybe you will inspire someone to help. Here at the Jane Goodall Institute, we think primates are pretty awesome. So, while the news reports little hope for the future of these animals, we will continue to think positively and maintain and expand our conservation efforts. How are you helping primates? Share your projects in the Project Database on www.rootsandshoots.org.